Romanian Meatball Soup...Ciorba de Perisoare. During the winter months, I tend to make soups much more often than during the summer months. I guess it's only natural as the colder months tend to bring below zero weather... and plenty of snow. Granted we don't always have the minus zero temps, but we do have snow and cold weather in general. We can't always stay inside, as there's snow to be shoveled, logs that need to be split, firewood that needs to be brought in... and yes, there's the regular walks that need to be taken:). In order to keep us warm, I often make a pot full of "ciorba" or Romanian soup. A bowl of good ol' Romanian soup usually does the trick of warming us up... especially if you add some hot peppers:). Most Romanian soups are generally "soured"...meaning acidity is added to the soup in the form of lemon juice, citric acid, bors de tarate ( fermented wheat bran liquid), sauerkraut juice, etc. The sour element adds a slight tang to the soup and changes the taste of a regular chicken soup to that of a "soured" version. Since I tend to want to make things "lighter", I usually adapt certain Romanian dishes according to my own preference. 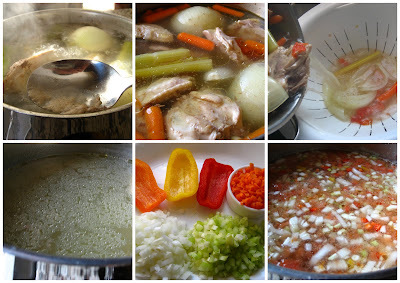 The traditional Ciorba de Perisoare or Meatball Soup, is usually made with beef.... but I most often make it with chicken. I find it's quite delicious and I don't necessarily miss the beef version. I will use a whole chicken to make the soup stock(from the bones) and then use the rest of the meat to make the meatballs. I like to grind my own meat and use the dark meat as well as the white. Using a regular size chicken will usually yield about 2 lbs of meat(+/-)... which is just the right amount for making the meatballs. * I didn't use the pressure cooker for this post... just because I know most people don't have a pressure cooker. If you have a pressure cooker and would like to use it, you can check out step#4(soup stock) below). 1. 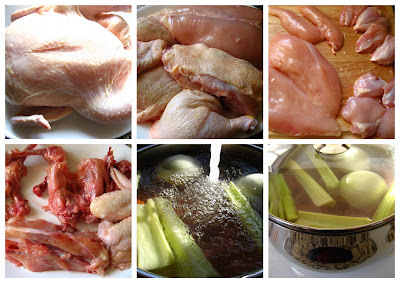 Wash whole chicken and cut into 8 pieces....I also remove the skin. 2. Cut meat from off most of the bones...except wings, back, and ribs. Basically, you will have the chicken breasts, with tenderloins, and the thigh meat as well as the leg meat. 3. Place bones in a large ( 6 QT) soup pot. Set aside. 4. 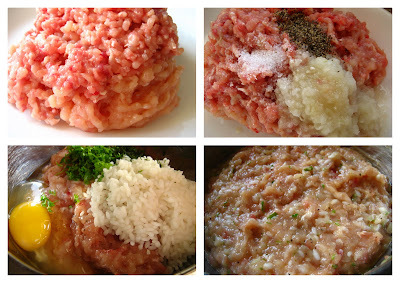 Grind meat and make meatball mixture. 1. In a sauce pan, add rice along with a bit of salt and about 1 cup of water. Cook rice until it still has a "bite" to it about 5-8 minutes. Strain. 2. In a bowl add the ground meat, grated onion, strained rice, egg, chopped parsley, dill and season with salt and pepper. Mix to fully combine. Cover meat mixture and refrigerate. Refrigerating helps with "stiffening" the mixture a bit so that it is easier to form into meatballs. 1. To the pot with soup bones, add 1 TBS kosher salt, celery, carrots, parsnip(if using), onion, and sliced garlic. 2. Fill pot with water... almost to the rim((not quite...about 1 1/2 inches below) . 3. Turn heat on high. Bring to boil and skim scum that accumulates. Lower heat and cover. 4. Cook on low for 1 1/2 hours...While the soup is cooking, you can cut up your soup vegetables. You can also do the stock in the pressure cooker... just place the chicken bones, water, vegetables and salt. Cover. Bring up to pressure. Lower heat to low and cook for about 40 minutes. Release pressure naturally and proceed to next step. 5. Strain soup. Place soup back on the stove and heat to medium-low heat. 6. Add extra soup vegetables to clear stock. Also add the grated tomatoes along with tomato paste. Let it cook while you make meatballs. 7. Take out meatball mixture from refrigerator. 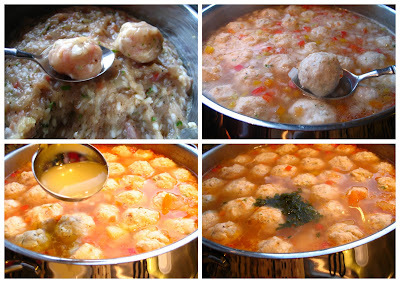 Working with wet hands( have a bowl of water nearby) form meatballs( about 1 TBS ) and place them in the hot soup. (if you have a small cookie scoop, you might make it easier on yourself, by using that...I tend to do it the old fashioned way:)). 8. Continue making meatballs and placing them in the soup until all meat is used up. 9. Add diced potatoes. Cover the pot and cook until meatballs and potatoes are cooked( about another 20 minutes or so....sometimes I let it go a bit longer ...especially if I feel the soup needs more flavor. Just letting all the vegetables and meatballs simmer away helps it all come together eventually). 10. Uncover and add lemon juice to taste. ( Add beaten egg, if using...most times I don't bother with the egg). Taste and adjust seasoning. Sprinkle with chopped parsley or lovage (leustean)....even chives will work. Serve ciorba with crusty bread and hot peppers. What a fantastic soup! Love all of the componenets. Ellie, you are an expert in Romanian food ! The pictures are awesome !!! I really want to taste your ciorba :)this winter!!! 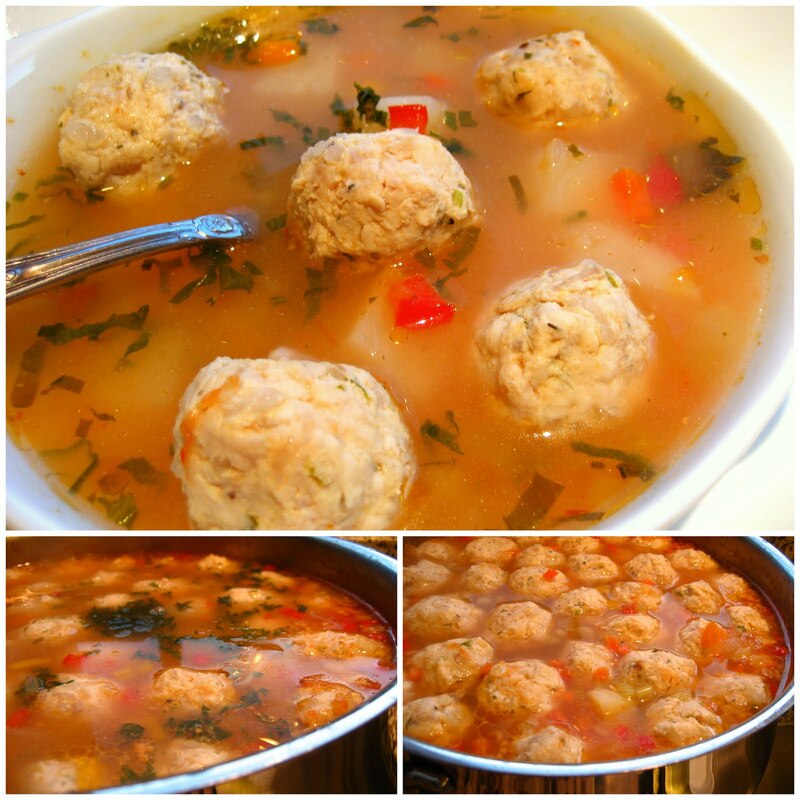 Jennifurla, Thanks...we definitely like the soup....and well, the meatballs are an added bonus:). Mihaela, That is sweet of you...thank you! Though I have to say, that I am NOT an expert in Romanian food...just love it:). WE all have our own ways of making a particular dish...sometimes, with memories attached....You have some wonderful Romanian dishes as well! Ellie, this soup looks fantastic! I am a huge fan of soups and I can really tell yours is full of flavour. Ellie ,te urmaresc constant si imi place mult ce gatesti!Am incercat multe retete de la tine si toate mi-au esit fff bine .Indiferent ce gatesti ,din mainele tale iese arta !!! Thanks Megi! Definitely worth making the soup from scratch...thanks for stopping by. Speranta, Esti o mare incurajare...am avut de la cine sa invat:)...mama! Stefania, Grazie mille!...Sono contento che ti piace la minestra:). Your recipes are wonderful..hearty but healthy. I've recently been reading a novel that takes place in Romania. Nice to get a feel for the culture through the food. LCulp, Thanks for stopping by and for your kind words...yes, I too, love exploring different cultures through food...glad you got a glimpse of the Romanian culture:). I just came back from my 3rd trip to Romania. This soup is one of my favorite things to eat there! Thank you so much for the recipe. This year I had a bean dish that I loved, but don't know the name. It was yellow/white beans with a strong, delicious garlic flavor. I thought perhaps they had been canned. Any idea what they could have been? Ciorba de perisoare is my favourite soup. Made it tonight in fact. Really tasty, especially heavily dosed with lovage. Wonderful recipes, thanks for sharing them. The dish you are describing sounds like a bean dip named "fasole batuta"...I am sure canned beans can be used though traditionally dried beans are used...cooked with some bay leaf(onion, garlic, carrots can be added for additional flavor). It is then pureed and and more garlic can be added to taste...sometimes a fried tomato paste and onion mixture is added as a topping...or simply some fried onion. Romfoody, We love this soup and have it OFTEN:)! Glad you enjoy Romanian food as well...and thanks for taking the time to stop by. Thank you for your recipes. My Romanian boyfriend is sick with the flu and I thought some home cooked ciorba may cheer him up and comfort him. I am a fan of ciorba de perisoare but can't ever find leustean.. Thanks again!! Yes, leustean isn't the easiest of herbs to find, but you can try using some parsley instead... or even some chopped chives. This is one of my favorite soups as well, I'm hoping you will like it...feel free to use any meat of choice.
! Very easy to read and great pics for instructions. I've never been more excited in my life to watch my muraturi!! Thank again for your help!!! liked them:). Always makes my day! I know many people have their own versions of various Romanian dishes, and some really cook by taste and don't measure ingredients. I just wanted to put the basic idea down in the hopes that it would help others... so glad the recipes and photos were of help to you! Mmm, that reminds me... I need to start a batch of muraturi myself:). Again, thank you so much for your feedback.... and really, just taking the time to comment. Greatly appreciate it!! PS Ai cumva si un cont de twitter sau pagina de FB cu retete? Anna, ma bucur mult ca ai nimerit aici pe blog, si ca iti place... incat sa te inscrii la emailuri:). Esti o scumpa, si apreciez mult! Imi pare bine ca pot fi de ajutor... si sper ca retata de ciorba sa ii placa lui prietena ta. Oricum, eu iti multumesc mult pentru cuvintele tale pline de incurajare:). Si mie imi place de mancat... ciorbe si altele:). Dar ciorbele sant favoritele sotului meu. Zice ca ari putea manca ciorba in fiecare zi:)! Anon, Sorry, nu am pagina de facebook:(... dar poti fi abonata pe email sa vezi cand postez.